Wireless connectivity is becoming a basic expectation in health care facilities, similar to other utility systems such as power, HVAC and water. The ability of caregivers to roam wirelessly, access electronic health records (EHRs) and have other information delivered into their hands anytime, anywhere can create workflow efficiencies, lower the cost of care, increase access and, ultimately, improve the quality of outcomes. In fact, information technology is now considered a transformational element in improving the delivery of health care, and connectivity is at the heart of it all. Several government and private entities are promoting the advancement of wireless for medical use. This includes federal legislation in the HITECH Act that indirectly spurred the use of wireless by providing a mandate and incentives for deploying an EHR as well as the Federal Communications Commission’s (FCC’s) allocation of 40 megahertz (MHz) of the 2360–2400 MHz spectrum for Medical Body Area Networks in May 2012. Leveraging that connectivity and navigating the coordination points is, however, still a developing concept. Wireless is a broad term that most users think of as a single system that will allow their devices to work in a medical facility with instant connectivity. In fact, facilities have several different and discrete wireless networks that serve individual applications and devices. patient telemetry and other wireless medical devices. Traditionally, each of these has had its own independent wireless network so, in practice, a hospital could have four or more separate wireless systems. There is typically a wireless local area network (WLAN) that is used for data and video transport. Telemetry is a separate proprietary system. Then, there is a distributed antenna system (DAS) that is used to propagate cellular, paging and radio-frequency (RF) signals. All of these systems must be separately managed and maintained. Bandwidth and throughput are issues as well. As the demand for more wireless access and applications has grown, it has created challenges within the hospital to provide available bandwidth and speed of delivery of the increasing data load. This seemingly unavoidable fracturing has created a snarl of wireless systems and services. Most organizations envision that wireless devices serving health care needs, such as patient monitoring, would be supported outside the hospital and between hospital and clinic health care delivery networks in a manner that supports the patient. This just isn’t feasible in the current framework of medical wireless connectivity. What is needed is a single ubiquitous network that works seamlessly with the multitude of devices within the complete health care wireless ecosystem, from inside the hospital, into the public realm and into the home. It is also desirable that this unified network be vendor neutral and come with a set of common and core standards. The Center for Medical Interoperability (http://medicalinteroperability.org), a recently formed, hospital-led nonprofit organization, has taken on the task of creating a national standard for a unified medical-grade wireless network. The overarching goal is to optimize patient care by driving rapid, widespread, sustained interoperability of medical technology. Through this initiative, the organization aims to address the connectivity challenge and elevate wireless to the level of a standard base building utility embedded in the hospital like power, water and HVAC. The key benefit of a single, open-design wireless network is to provide a managed physical wireless infrastructure that allows for deployment of virtually any wireless technology. It allows adoption and deployment without having to create alterations to accommodate new technologies. Additionally, it allows for a wide variety of bandwidth compared with multiple single systems with narrow bandwidths. A medical-grade wireless utility affords hospitals the ability to make device decisions based on infrastructure, instead of infrastructure decisions based on the device, eliminating the fractured nature of managing and maintaining separate networks. Ultimately, it provides greater future flexibility and lower long-term operating costs. 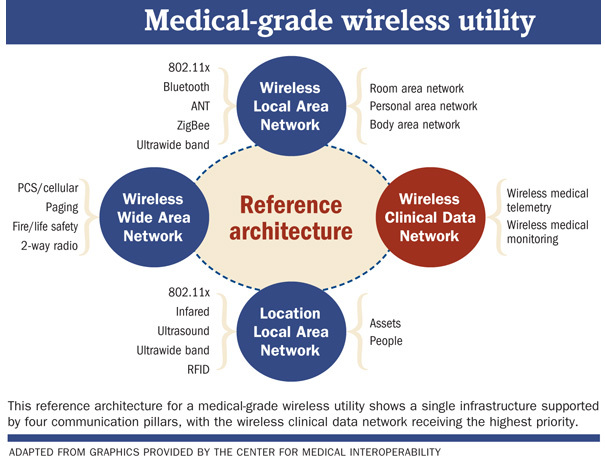 Several characteristics define a wireless system as medical-grade. First, it should be a single physical wireless infrastructure that serves all wireless devices. It also must feature appropriately designed coverage and offer a consistent and high-quality signal within the coverage area. It must have the capacity to support all devices within the coverage area as well as security that encompasses physical, over-the-air and digital measures to protect information. Finally, it must ensure the ability of the protocol to operate in a wireless environment. WLAN. This is used for personal, body and enterprise data. Wireless wide area network (WWAN). This is used for mobile phones and radio traffic. Location local area network (LLAN). This is used for asset and other location-based services. Wireless clinical data network (WCDN). This is dedicated to medical monitoring, telemetry and other medical devices. Health facilities professionals can think of it as a multilane freeway in which the lanes are dedicated to certain types of wireless traffic. For example, one or two isolated lanes are dedicated to medical telemetry and patient monitoring. They are protected securely where traffic moves freely and undisturbed by other traffic. Meanwhile, other lanes serve mobile phones, paging, voice and wireless data traffic. Medical-grade traffic has the highest priority in terms of time, criticality, security and acuity. Consumer-grade traffic, such as for mobile phones, has a lower standard in all of these areas. For instance, health facilities professionals would want a minimum standard of 100 percent area coverage for medical-grade traffic, but could get by with a lower minimum standard of 90 percent coverage for mobile phone traffic. The reasoning is to design to the need of each wireless element to lower initial design cost and long-term operational costs. The physical design of a medical-grade wireless network is focused on deployment of an engineered antenna structure throughout the hospital to achieve the area coverage requirements. It creates the freeway that acts as the signal transport backbone. The advantage of using the antenna as the central design element is that it can accommodate multiple wireless frequencies that serve multiple technologies. Active equipment that is specific to each wireless technology and bandwidth frequency is injected into the transport backbone at technology distribution rooms throughout the facility. This allows for powered active equipment to be centrally located in equipment rooms or in corridors (in the case of wireless access points) to be managed more easily. This provides an efficiently designed system both from a systems architecture and a spatial architecture perspective. This type of design incorporates small-cell architecture, which creates small, point-located wireless and cell sites within the hospital. The advantage of small-cell architecture is that it provides performance and capacity uplift in a geographically dispersed manner, thereby lessening bottleneck issues that can occur with traditionally designed wireless systems. Small-cell architecture is a primary driver for the major cellular phone providers because it provides a relatively low-cost design method that allows them to extend their edge network to get greater coverage and maintain a relatively high level of signal quality. Small-cell architecture is a crucial element in the design of the cellular provider’s long-term evolution (LTE) networks. The FCC is helping to grow the use of small-cell architecture through a recent proposed ruling that will make available 100 MHz of shared spectrum in the 3.5 gigahertz band for use with small-cell and database technologies. Once the in-hospital wireless infrastructure is laid out, how can a bridge to the corner coffee shop and into the home be created? While still in the future, much of that is being driven by the major cellular providers’ seeking new sources of revenue. The major mobile wireless carriers are investing billions in health care, leveraging their 4G LTE networks to make them medical-grade, which will provide a seamless network and secure transmission of clinical data from inside the hospital into the home and vice versa. The vision is that hospitals would host small-cell architecture sites for the carriers, which would be part of a single carrier integrated wireless system that extends outside the hospital. EHR vendors, software companies and mobile wireless carriers also have developed patient-focused applications and will continue to do so. These applications will be put into patients’ hands and allow them to be monitored while also giving them a bigger role in managing their own health care. Security and privacy of data is a focal point issue in the development of connected health. Tight regulations and hospitals’ fear of HIPAA noncompliance are the most significant barriers to enabling the democratization of data that are needed to enable connected health. Work continues to advance in terms of encryption technology that will enable reasonably safe methods of moving data. In the end, patients will drive down the barriers, in part by giving permission for their data to be shared, along with technology that provides safely encrypted data transfer. Planning for a medical-grade wireless utility in the hospital is a paradigm shift from the traditional wireless network. It is designed around antenna placement to obtain coverage, and strategic location of equipment, requiring early planning in terms of special and architectural elements. A medical-grade wireless utility can be installed either in new construction or in an existing facility. Its operational benefits include adaptability to a multitude of technologies, high coverage within a facility and the ability to deploy new technologies without having to install additional infrastructure, thus avoiding disruption of patient care operations. The long-term benefits include providing greater patient access, assuring higher quality outcomes, increasing operational efficiency and lowering the cost of health care. The investment of industry stakeholders in standards and guidance can be leveraged by health care organizations to competitive advantage. So what is the cost for all of this? A major medical center in southern California embraced the implementation of a singular medical-grade wireless utility in one of its new buildings and was able to achieve an 8 to 10 percent savings on initial capital cost, which included a reduction of 1,500 data drops compared with the traditional installation of separate wireless systems. In Massachusetts, another major medical center deployed a new medical-grade wireless utility. It has been able to track long-term operational savings from not having to adjust, add or alter the wireless infrastructure as new wireless technologies are deployed. Because of the ability to put the infrastructure in and take advantage of centralized locations for equipment, the medical center no longer needs to disrupt areas of the hospital or open up ceilings to construct wireless infrastructure when new systems are adopted. The case for a single medical-grade wireless utility, treated as a base system in a facility, provides tremendous flexibility and overall cost savings over the life of the building. The end goal is an overall cost-reduction in the delivery of high-quality health care. Connected health is a brave new world, and the medical-grade wireless utility is the vessel that will get health care facilities there. Tom Leonidas, PE, is executive vice president of Wood Harbinger, a Bellevue, Wash.-based consulting engineering and technology firm. He also is a member of the Facility Guidelines Institute’s 2014 Healthcare Guidelines Revision Committee, heading up the technology subspecialty group. He can be reached attleonidas@woodharbinger.com. • Integration drives integration. Having successful organizations set up a system of continuous process improvement so that the first five drivers integrate with each other. Barriers to achieving the vision of connected health and portability of health care data are both technological and political. • Technology. An exchange of health information, geographically between caregivers and from caregiver to patient, requires a viable and secure network infrastructure. There is no governing standard today that is driving the health care industry toward a single focused infrastructure solution that invites open architecture and greater environmental interoperability. Additionally, electronic health records and other systems aren’t interoperable. Various technologies do exist that can tie different systems together by acting as middleware or software translators, but implementation of these translators can be complex and expensive. • Politics. Enacted in 1996, HIPAA is a double-edged sword. Its underlying purpose was to promote efficiencies and reduce errors through electronic records that allow the exchange of health care data. However, compliance has produced the opposite effect in many cases, as providers and medical centers err on the side of caution in sharing information and withholding data so as not to take a chance on being cited for privacy violation and potentially severe penalties.